You’ve heard of the IMF, right? 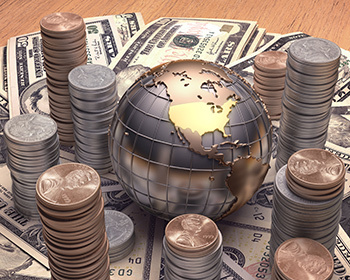 If not, the acronym stands for the “International Monetary Fund.” It’s an organization founded in 1945 to foster monetary policy cooperation, facilitate trade, and otherwise improve economic conditions worldwide. Some people love it. Others hate it. Many ignore it. But one IMF publication I do NOT ignore is its “Global Financial Stability Report.” This twice-yearly analysis contains gobs of econo-speak, scores of complex charts, and more footnotes than you can shake a stick at. But hidden with that is critical market intelligence you simply can’t find elsewhere. I’m not going to mince words: The just-released April 2018 update should scare the bejeezus out of you! That’s because it essentially confirms every worry I’ve been sharing about the “Everything Bubble” — and explains why it could start popping very soon. IMF (Page 10): Against a backdrop of mounting vulnerabilities, risky asset valuations appear overstretched, albeit to varying degrees across markets, ranging from global equities and credit markets, including leveraged loans, to rapidly expanding crypto assets. MY TRANSLATION: In the last two major bubbles, the problems were mostly contained to dot-com stocks and housing. That is 100% NOT the case now. Almost every single asset on the planet — from stocks to bonds to loans and more – is wildly overpriced. There is zero room for error with prices at such dizzying heights. IMF (Pages 12 and 15): Against a backdrop of low default rates, corporate spreads remain at very low levels, even in the riskiest segments. Favorable financial conditions have boosted corporate bond issuances. Issuance of riskier bonds has surged, and the share of lower-grade bonds (BBB-rated) in the investment-grade universe has been rising. 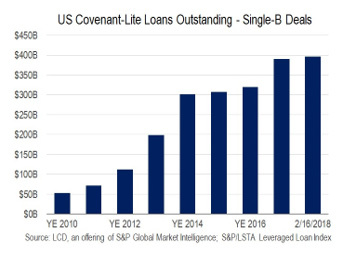 The global leveraged loan market now offers an interesting example of the extent to which reach for yield has supported issuance and adversely affected price and nonprice terms, as well as credit quality, despite efforts by regulators to rein in risk taking. Strong issuance and lofty valuations, including a weakening of nonprice terms such as investor protections, could exacerbate the next default cycle. A sharp rise in defaults following a tightening of financial conditions, or a shutdown of the market at the extreme, could have large negative implications for the real economy given the growing size of the loan market to date and the role it plays in channeling funding to corporations. MY TRANSLATION: Investors have been buying anything and everything that isn’t nailed down in the corporate bond and loan markets. That’s allowing even the lousiest, highest-risk companies to raise money — at extremely low rates and without giving lenders the standard protections they’ve counted on in the past. Cov-Lite loans offer the least protection for lenders because they don’t include strict rules on how much debt borrowers can take on, how much cash they have to generate to service those debts, how often they have to meet financial performance milestones, and so on. B-rated borrowers are those considered high yield, or “junk” borrowers, as opposed to investment-grade ones. You can see that loan volume is exploding. In fact, the total amount of this garbage debt outstanding has surged roughly EIGHT TIMES OVER since 2010 to an all-time record of $396 billion. 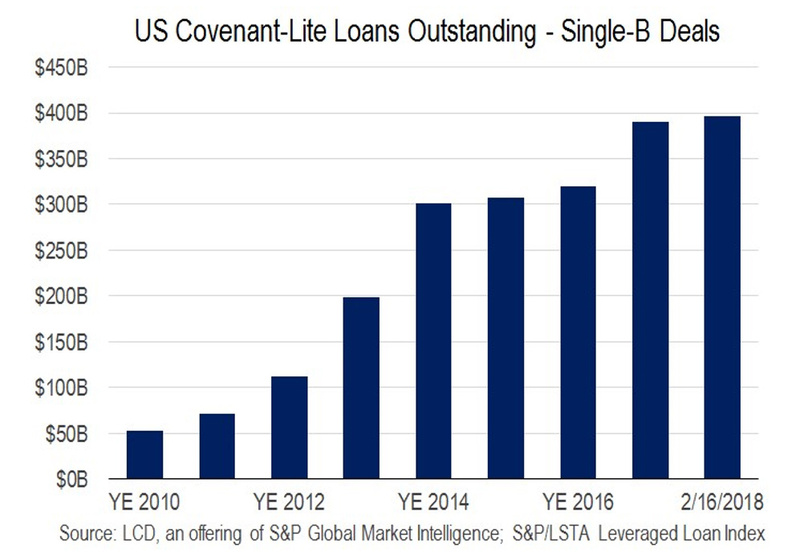 It now represents a whopping 75% of all outstanding leveraged loans — far and away the highest market share in history. As a result, when the economy weakens, defaults and losses are going to pile up like corpses on Wall Street’s doorstep. And that will make 2007-2009 look like a walk in the park! MY TRANSLATION: Remember the alphabet soup of garbage investment vehicles that bought up all those risky mortgage bonds in the mid-2000s? The ones that got AAA ratings, but eventually collapsed when housing prices tanked? Like Carol Anne said in the movie “Poltergeist II” ... “They’reeeee Baaacccckkkk!”. Only this time, they’re just investing in all kinds of new and different lousy bonds. Meanwhile, investors have taken on the most margin debt in the history of the stock market. And to top it all off, hundreds of billions of dollars’ worth of “hidden” leveraged bets are being made by funds that regulators can’t even track accurately. Comforting, eh? IMF (Page 19): The rise in ETFs, particularly those investing in relatively illiquid assets, may increase contagion risk and possibly amplify price moves across asset markets during periods of stress. Greater investment in passive investment strategies, such as ETFs, may be related to the rise in cross-asset correlations during periods of stress, one of the main attributes of contagion. Benchmark-focused investors are more likely to be driven by common shocks than by the idiosyncratic fundamentals of assets they invest in. MY TRANSLATION: When you sell an ETF that owns shares of GE or IBM, the ETF manager can raise cash by unloading the underlying stocks with virtually no impact on their price. But these days, there are thousands of ETFs investing in all kinds of out-of-the-way corners of the capital markets. They often own hard-to-buy/sell/price assets like complex bonds and loans, each with their own specific characteristics. That means no two groups of bonds or loans are exactly alike, even those issued by the same underlying companies! When hair-trigger ETF investors get scared and start firing off “Sell” orders, guess what? Those ETFs have to dump their holdings quickly. But if the underlying stuff they own rarely trades, or is very difficult to price, what happens? Prices plunge, the markets freeze up, and you get a classic “Run on the Bank” moment. IMF (Page 26): Monetary policy normalization in advanced economies could result in a tightening of global financial conditions and a reduction in capital flows, increasing rollover risk and adversely affecting productive investment. With weaker issuers increasingly able to access capital markets and with fickle investors playing a larger role in recent years, stress amplifiers have risen. In addition, a considerable number of low-income countries and other small non-investment-grade issuers have experienced a sharp deterioration in debt sustainability. Meanwhile, the creditor composition in these countries has become more complex, posing policy challenges for ongoing and prospective debt restructuring. MY TRANSLATION: High-risk emerging market countries have been feeding at the trough, too, issuing record amounts of debt. A lot of that debt is held by gun-slinging hedge funds and other investors who couldn’t care less about the underlying fundamentals. They only bought it because yields were low worldwide and they could pick up a few extra percentage points by doing so. As the Fed raises rates and other central banks roll back QE, those countries and investors are screwed! Everyone will try to get his or her money back at the same time, but there won’t be enough liquid bonds and cash to go around. Yet another component asset of the “Everything Bubble” — this time, emerging market bonds — will plunge in price. Defaults and losses will subsequently pile up around the world. IMF (Page 48): In the aftermath of the VIX tantrum, and after years of prolonged low interest rates, investors and central bankers are faced with increasing maturity and liquidity mismatches as well as rising leverage that may amplify market turbulence down the road. The extent of institutional investors’ exposure to short volatility positions remains unclear. Yet estimates of the price of risk, based on volatility projections, are now very close to the levels observed before the episode, which broadly implies that investors’ willingness to sell volatility remains robust today despite the tremors in early February. Moreover, valuations remained stretched, amid a sustained increase in correlations across asset classes since the episode. MY TRANSLATION: Remember that VIX-plosion we saw in February? The one that caused some volatility-focused ETFs to lose more than 90% of their value in a single day? Fasten your seatbelt, because you ain’t seen nothin’ yet! We have no idea exactly how much money has been bet on the assumption that the entirely abnormal, ridiculously placid environment of 2015-2017 will persist. But we know it’s a lot, and we know those days are over. Since stock valuations are at nosebleed levels, the minute things start to go south, we’re going to see chaos all over the place. IMF (Page 93): Rising house prices have been a feature of the economic recovery in many countries since the global financial crisis. But recent increases have also been occurring in an accommodative monetary policy environment in many advanced economies, raising the specter of financial instability should financial conditions reverse and simultaneously lead to a decline in house prices ... Strikingly, the chapter finds an increase in house price synchronization, on balance, for 40 countries and 44 major cities in advanced and emerging market economies. The chapter’s analysis suggests that countries’ and cities’ exposure to global financial conditions may provide an explanation for the increase in house price synchronization. MY TRANSLATION: Remember the U.S. housing bubble? It’s back, too — and it has gone global! This one isn’t being driven by a proliferation in garbage subprime lenders or junky mortgage bonds like last time. It’s being driven by the global flood of easy money. The housing bubble has returned due to the global flood of easy money. That raises a huge NEW risk: All real estate is no longer local. 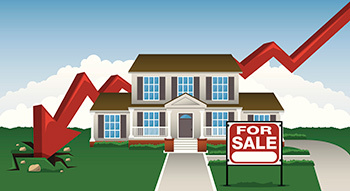 If prices and lending tank in foreign markets, it will likely blowback here in the U.S. with tighter lending standards, falling house prices, and surging defaults and foreclosures. That’s particularly true for high-priced markets with more international owners and investors, such as large Northeastern and Mid-Atlantic cities, California, the Pacific Northwest, etc. In all my years of reading IMF reports, as well as similar “think pieces” from other research groups, I don’t think I’ve ever seen one that lays out such massive risks quite like this. And these aren’t far-off-in-the-future risks that lack a clear catalyst to cause them to explode. They’re risks that are ALREADY starting to come home to roost. Just look at the plunge in government or junk bond prices over the last several months. Or the interest rate hikes and QE cuts coming from the Fed. Or the VIX-plosion in February. Or the subsequent inability for the stock market to launch a rip-roaring, broad-based, V-shaped recovery like all of those we’ve seen since 2009. The times ARE changing. The risks ARE here. You simply have to recognize and adapt to them if you want to protect and grow your wealth in the remainder of 2018 and beyond. I’ve given you many broad-based guidelines on what to do here. And I’ve shared specific strategies and recommendations with members of my High Yield Investing. Make sure you heed them — because even the IMF is now admitting that the Everything Bubble is in its final stages!